I've never really been the type of dancer that has enjoyed choreography and making dances in the past. It's always been a stressful process for me, mostly because I'm too concerned with whether or not the audience will like this or that. This past week, my choreography was showcased in the final senior thesis show at University of the Arts. These beautiful ladies worked their butts off and did a fabulous job of taking the movement that I have them and making it something real, something tangible. It's truly amazing what they did and in a show filled with senior class dancers, these first year students seriously held their own. It was really inspiring for me to watch what I created unfold from an audience members perspective. By the final night, their performance had me in tears wishing I could make a career out of choreographing. 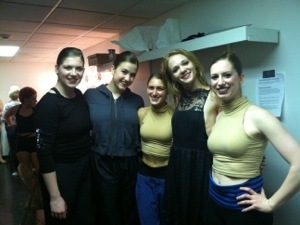 Above photo: (left to right) Elizabeth Rush, Katie Mroczek, Melissa Hyatt, Jillian Dreusike & Abby Stachnik. 4/12.